Using Hubble Space Telescope, astronomers have uncovered a previously unseen population of seven primitive galaxies that formed more than 13 billion years ago, when the universe was less than 3 percent of its present age. The deepest images to date from Hubble yield the first statistically robust sample of galaxies that tells how abundant they were close to the era when galaxies first formed. The results show a smooth decline in the number of galaxies with increasing look-back time to about 450 million years after the big bang. The observations support the idea that galaxies assembled continuously over time and also may have provided enough radiation to reheat, or reionize, the universe a few hundred million years after the big bang. These pioneering observations blaze a trail for future exploration of this epoch by NASA's next-generation spacecraft, the James Webb Space Telescope. Looking deeper into the universe also means peering farther back in time. The universe is now 13.7 billion years old. The newly discovered galaxies are seen as they looked 350 million to 600 million years after the big bang. Their light is just arriving at Earth now. The greater depth of the new Hubble images, together with a carefully designed survey strategy, allows this work to go further than previous studies, thereby providing the first reliable census of this epoch, say the researchers. Notably, one of the galaxies may be a distance record breaker, observed 380 million years after the birth of our universe in the big bang, corresponding to a redshift of 11.9. The results are from an ambitious Hubble survey of an intensively studied patch of sky known as the Ultra Deep Field (UDF). 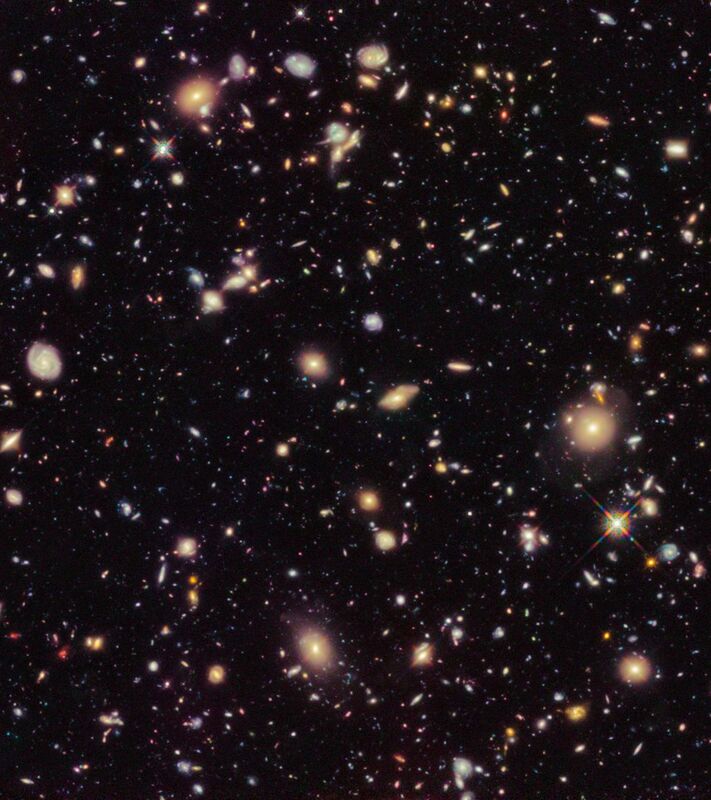 In the new 2012 campaign, called UDF 2012, a team of astronomers led by Richard Ellis of the California Institute of Technology in Pasadena, Calif., used Hubble's Wide Field Camera 3 (WFC3) to peer deeper into space in near- infrared light than any previous Hubble observation. The observations were made over a period of six weeks during August and September, and the first scientific results are now appearing in a series of scientific papers. The UDF 2012 team is publicly releasing these unique data, after preparing them for other research groups to use. Astronomers study the distant universe in near-infrared light because the expansion of space stretches ultraviolet and visible light from galaxies into infrared wavelengths, a phenomenon called "redshift." The more distant a galaxy, the higher its redshift. A major goal of the new program was to determine how rapidly the number of galaxies increases over time in the early universe. This measure is the key evidence for how quickly galaxies build up their constituent stars. "Our study has taken the subject forward in two ways," Ellis explained. "First, we have used Hubble to make longer exposures than previously. The added depth is essential to reliably probe the early period of cosmic history. Second, we have used Hubble's available color filters very effectively to more precisely measure galaxy distances." The team estimated the galaxy distances by studying their colors through a carefully chosen set of four filters at specific near-infrared wavelengths. "We added an additional filter, and undertook much deeper exposures in some filters than in earlier work in order to convincingly reject the possibility that some of our galaxies might be foreground objects," said team member James Dunlop of the Institute for Astronomy, University of Edinburgh. 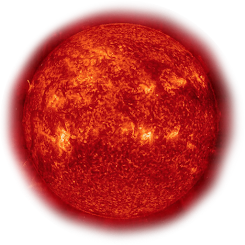 For galaxies whose light has been shifted to infrared wavelengths, Dunlop said, the intervening hydrogen will have absorbed all of the light that was originally emitted as visible light and most of the light initially released at near-infrared wavelengths. Therefore, these galaxies will not be detected in most of Hubble's filters. They will only be seen in Hubble's longer-wavelength infrared filters, which hold the key to discovering the earliest galaxies. The results from the UDF 2012 campaign mean there may be many undiscovered galaxies even deeper in space waiting to be uncovered by the Webb telescope. "Although we may have reached back as far as Hubble will see, Hubble has, in a sense, set the stage for Webb," noted team member Anton Koekemoer of the Space Telescope Science Institute in Baltimore, Md., who oversaw the Hubble observations and combined the images. "Our work indicates that there may be a rich field of even earlier galaxies that Webb will be able to study." Astronomers have long debated whether hot stars in such early galaxies could have provided enough radiation to warm the cold hydrogen that formed soon after the big bang. This process, called "reionization," is thought to have occurred 200 million to a billion years after our universe's birth. This process made the universe transparent to light, allowing astronomers to look far back into time. The galaxies in the new study are seen in this early epoch. "Observations of the microwave afterglow from the big bang tell us that reionization happened more than about 13 billion years ago," said Brant Robertson of the University of Arizona in Tucson. "Our data confirms that reionization was a drawn-out process occurring over several hundred million years with galaxies slowly building up their stars and chemical elements. There wasn't a single dramatic moment when galaxies formed; it was a gradual process."